Outside the offices of the Housing Agency on Mount Street Upper in Dublin 2. Brendan Ogle, of the Home Sweet Home group, and Minister for Housing Simon Coveney (top) speak to the media after seven hours of talks. Mr Ogle told reporters the parties agreed not to disclose details of the talks. 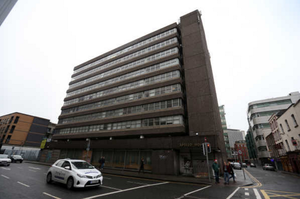 Just before Christmas, the High Court ordered that Apollo House, which is being occupied by the HSH group to provide accommodation for rough sleepers, be vacated on Wednesday, January 11. 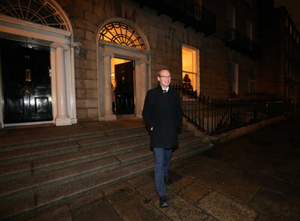 Posted in Misc and tagged Apollo House, Simon Coveney, talks at 12:24 am on January 7, 2017 by Broadsheet. Extra time needed. Ogle et al to win on penalties. I bet this alias seemed a lot funnier in your head. You will make us laugh one day. Don’t worry you will get there. Your computer hours will pay off soon. I have no doubt that the rest of the HSH people are well-intentioned, nice people – Ogle is an opportunistic @r$ehole. Claiming he is worried about homeless people having somewhere warm to sleep this Christmas when just a couple of years ago he was threatening to shut off pensioners’ electricity during one of the coldest winters in decades – there isn’t a bandwagon that that man won’t jump on for a bit of political gain. Fupp him. Ogle has done more to help people in one day than you will in you’re pathetic lifetime. Rob I don’t recall these threats you wrote about. I recall he was a train drivers Union leader. Leaving that aside don’t you think it’s the job of a negotiator to negotiate with whatever strengths they have at their disposal? Or even if I accept and you can show that he’s a baddie, when did it become impermissible for a negotiator to turn his attention to causes that have no conceivable, real personal gain for him? Personally I’ve often got involved in “causes” not because in particular I stand to gain personally from it in any direct way but usually because I like the people involved or am otherwise convinced that their cause is a just one. The gay marriage one being a case in point. What has any of that got to do with the point I raised? Is it not possible for a “bad” man to argue for a “good” cause? Ogle is a disgusting populist demagogue. And of course he’s taking all the money raise by Home Sweet Home to fund his own union. You have evidence of this have you Leeran? Maybe they’re planning to withdraw all Glen Hansard recordings in exchange for something? funny to see those awful baddies in msm newstalk reporting on home sweet home and hsh relying on newstalk for updates. What’s so funny about that? Are you psychotic? Coveney says he had a good and frank discussion…he musta said he doesnt give a tuppeney fupp about the homeless or the reasons why record numbers of people are being forced into homelessness then. 4% per annum for the next 3 years for landlords, on top of already record high rents shows who he cares about. These sociopathic scroungers on the gravy train in the Dail need to go. And soon. The Late Late tonight showed a clip of that other sociopath Michael Noonan talking about the benefit of what Vultures do. They clean up the dead carcass he says..that’s all that’ll be left by the time FG are done with the country. 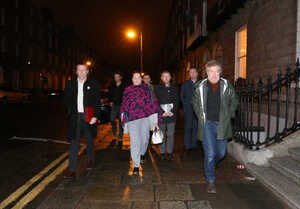 Politicians who own investment properties should have no part in discussion regarding homelessness whatsoever. Absolute conflict of interest. this is an exercise in optics management. nothing else. 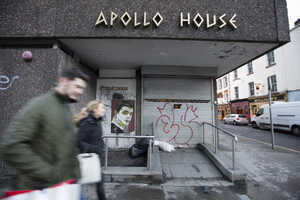 Coveney simply wants to avoid ugly scenes down at Apollo House on the day because that’s what matters for himself, his party and his party’s stakeholders. the trough must be kept intact at all costs! Which side co-opted every famous fupper with a guitar and half a brain cell again? That investment property ownership thing…. Have you nothing useful to contribute? Who really talk a lot and say nothing except it’s about GAA. Maybe stick to what you know? you correctly chose to leave behind? For such an attention seeking lady of the night you don’t seem to like the celebs using their celebrity to bring attention to good causes at all. A nicer way of saying hoor. Attention seeking one like. What are your views on the homeless crisis and sky rocketing rents and people shacked up in hotels and property moguls buying up everything paying no tax? Any opinions on that? Easier to take a pop at the celebs I suppose. Mods can someone abuse another user like this ? Calling them such an abusive name? I would hope the user has more respect for women in real life. I do like you Anne. You’re quite belligerent at times but what you have to say is often well researched and backed up by relevant links. Even if I don’t agree with every point I respect you make the effort to explain where you’re coming from. So many male commentators like classter, reprobertie and Clampers here and in particular this Frilly gobshite “declaim” their points of view as received wisdom from a bully pulpit expecting what I call the humilitariat to lap it all up like good little supplicants. It’s what I call typical paddy peasant communications. Now I’m doing it myself. Sermon over but keep at what you’re doing. On the Noonan thing what people forget is one of his man’s first claims to fame was the Bridget Cole story. Look it up. It’s extraordinary that such a man got near any sort of public office again. It seems on the basis of yesterday’s revelations that Michael Noonan’s involvement in the pursuit of Mrs McCole was much closer than he indicated to the Dail and more in keeping with what Brendan Howlin told RTE. It is hard to understand why Mr Noonan would have been shown the letter in advance, if not for his approval of its contents. And if his approval was being sought, how could he tell the Dail that “I was not asked for my permission”? In a functioning democracy, the word “versus” in the title of the legal case “Bridget Ellen McCole versus the Minister for Health”, setting the interests of a citizen against the interests of her political protector, would have no conceivable meaning. But to a dying and grossly-wronged woman, to her husband and children, its meaning was made all too clear. Now that the last big question in this terrible saga has finally been answered, its meaning is clear to the rest of us as well. The simple answer to the question put by the McCole family is that their State saw Bridget Ellen McCole as an enemy. Obvious as that answer now is, its implications remain almost unthinkable. Embarrassing, your pisstake winner alias is being used to back you up now? See it wasn’t as funny as you thought it be Anne, was it? Anne is one of the most obnoxious commenters I’ve encountered. Don’t worry about her. Oh, and “Comments and questions are welcome. has gone out the window it seems. That’s why Listrade was such a breath of fresh air the other day. There used to be more of that. But fighting gets more clicks. Frilly, the tiny shred of what passes for credibility (by virtue of being featured on a ‘web site ‘) has long since deserted you. I’d knock it on the head meself, your views do not accord with common decency. Yet more uncritical thinking from you. Of course. Not even a shill. Just a drone. Different strokes for different folks Anne. Who was your previous troll persona? I’d love to see that “the benefit of what vultures do”. Please tell me you’re joking about that? I think that’s fine for business, Kieran. If someone wants to speculate in steaks or vodka or a dodgy casino then good luck to them, I don’t have to give them money, but I cannot give up living indoors until “the market” “settles”. 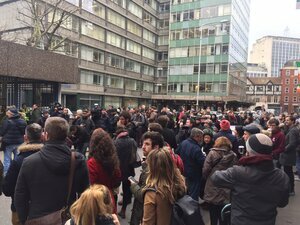 (businessinsider.com have a delightful piece on a Google employeee who lived in the carpark and saved 90% of his income! of it then it’s still ten-times as bad as Ireland. We bulldozed 100,000 unwanted houses with an estimated 150,000 in scattered villages and unfinished estates. These are the dead carcasses, in my view. We subverted planning to make enormous profit for boggy fields. Then we sold off properties in urban centres because it brought in outside money to help fill the hole. If it wasn’t profitable then nobody would bother with us. However we should acknowledge and plan for the resultant displacement of people, isn’t that why we’re on the big money? The problem is, beaurocracy gives some people unwarranted importance and tolerates wasters, the free market weeds these out. If only there was a balance. Anne is Winner. Winner is Anne. Two mean trolls. Not at all obnoxious KFC. Taking a chance on it? 90% write downs for Vultures on mortgages is some chance to be taking all right. Like I said, Anne, outside money had to come in. Only borrowers could outbid the vultures, no use to the economy. I think it was possible to cap the rents at the 2007 level, that should service the mortgages from the peak while still offering generous returns for Noonan’s environmental warriors. Yeah understood but re the economy..who’s it supposed to be for working for? How’d you mean Noonan’s environmental warriors? Anyway, I think “the market” is a massive bureaucracy with armies of lawyers and legions of accountants and lobbyists, tens of thousands of them. Trade deals, tax laws, price structuring, the market is the one that interferes. Of course. I like to speak in riddles sometimes. I’ve been down in the Four Goldmines a few times. What’s striking is how banal and mundane it is. Nothing like on TV. I was so disappointed. … the “environmental warriors” were the vultures cleaning up the landscape… I presume the argument is that any controls would scare them off. Home sweet home.. Let’s start with working people shall we? Housing the hard cases of society can follow. I won’t hold my breath. They’ve clearly had enough of your rubbish. Seriously, are we supposed to ring the psychic hotline to find out more, so we can understand what the giddy fupp you’re on about. Something about Rural Ireland..something about Inns..hang on it’s coming to me now…it’s coming…I know.. you must be on about a Christmas Nativity down in rural Ireland. Clown..delighted they told you p*ss off with your nonsense..again. You were turning Fridays from TGIF to Oh Fupp Its Friday. You’re so special Frilly..so unique, so original.. Keep it cryptic coz it’s a pile of cow poo anyway. Happy New Year. I was going to write “Drunken Loser” but then I noticed the timeline- maybe you’re still up? BS have some sort of submissions standard? This comes as pretty massive news. Especially measured against the commentary on this thread in particular. Someone has used the term “poignantly”. Always a warning sign of unasked-for stating of the obvious. Never stop complaining, do you Michael? Hey Kenny, or can I call you Konrad..? Conny Plank died in 1987, before a lot of BS kids were born. Don’t get me wrong – I think it’s a good name. I like it. – I just think that Holger Cxukay or Damo Suzuki would be funnier. 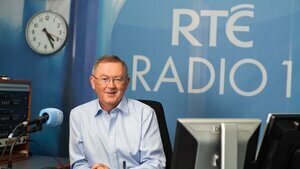 Besides, Pat Kenny Plank is still around. Feel free to use your own suggestions. Damn, I’d forgotten all about that ex-RTÉ eh… bloke. – I owe you one, Mr. Plonker. Thanks for ruining me weekend.